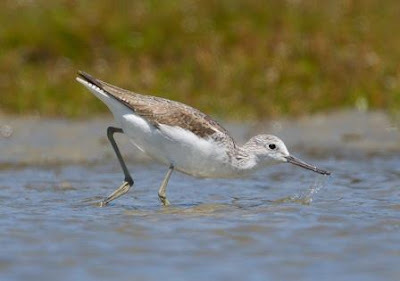 Wader Quest: When common is rare. Phil Battley has just sent us this excellent photograph of a Common Greenshank which is anything but common in his neck of the woods, Palmerston North in New Zealand. Phil is a senior lecturer at Massey University in the Ecology group. One of his research interests is long distance migration in waders, and we hope that we will be able to visit him and talk to him about this when we eventually get to his part of the world. The Bar-tailed Godwits that he is studying make a massive 11.000 mile non stop migration from Alaska to New Zealand, but on their return journey they touch down in Asia. Little is known about this return route and Phil and his team will be radio tracking godwits on their long haul north to breed once again in Alaska, the results should be fascinating.